I hope you can take a moment to stop what you’re doing and read this urgent email. Over the last six weeks, Iowa Gun Owners has been spending tens of thousands of dollars trying to educate voters in key districts across the state of Iowa about the anti-gun positions that their legislative candidates hold. As you’ve likely heard by now, in Senate District 5 we’ve been pounding the air waves, pouring in targeted direct mail, as well as going house-to-house with field staff and volunteers to make sure everyone knows that Senator Daryl Beall is Michael Bloomberg’s puppet in the Iowa Senate. Just two weeks ago, in Senate District 27 (which includes towns like Mason City and Clear Lake) 55 volunteers helped IGO staff as we passed out over 5,000 fliers in a district where we’ve already sent thousands of pieces of direct mail, and weeks of sponsored Facebook posts. 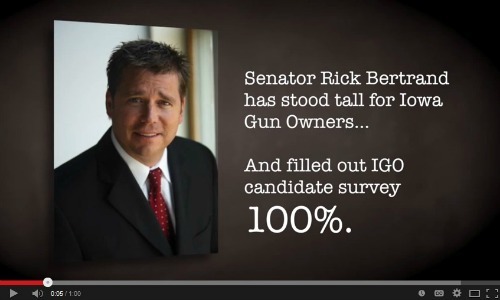 IGO wants to make sure that the voters know that Amanda Ragan voted against Constitutional Carry, chose to take no action to support our Stand-Your-Ground bill, and has REFUSED to sign our candidate survey this election cycle. We’ve been pouring information out in House and Senate Districts statewide, using mail, social media, robo calls and more! We ran a thorough ground operation in Sioux City last weekend with a fantastic team of volunteers – meantime our new radio ads for Sioux City, featured below, are pounding the airwaves! As I type this, my staff and I are preparing to meet with a whole team of IGO volunteers in Fairfield, Senate District 41, where we intend to educate thousands of voters as to the 100% pro-gun positions taken by Senator Mark Chelgren. Senator Chelgren has long been a stalwart for the second amendment, cosponsoring many pieces of our legislation, and has signed our Gun Rights survey 100% pro – gun this election cycle. I could go on, as Iowa Gun Owners is focused on many races all across the state. We are literally working around the clock pounding out emails, sending out targeted mail, developing radio ads like the one you heard above, and working with hundreds of volunteers to expose radical gun control and the politicians that support it, in all its forms all across the state of Iowa. But I’m not sure it’s going to be enough. That’s why I’m asking for your immediate help today! I know I’ve asked a lot from you over the last couple of weeks – but I don’t know what else to do. If radical gun control legislators can do the bidding of billionaires like Michael Bloomberg and push legislation like Senate File 2179 – without facing severe repercussions – then nothing will prevent them from pushing that much harder when the gavel falls next legislative session. We simply must hold them accountable and send a loud message that gun control will not be tolerated here in Iowa! There are three more critical districts where anti-gun legislators are running in fear, hoping that their radical anti-gun records don’t get exposed to gun rights’ activists in their districts. >>> In HD 82; down in southeast Iowa, Representative Curt Hanson is hoping that his votes against Stand-Your-Ground, his multiple votes against Constitutional Carry, and his votes against a right to keep-and-bear-arms amendment to the Iowa constitution will not be made known to voters in his district. >>> In HD 18; over in western Iowa, Paul Thelen is hoping that he can quietly fool the voters in that district into believing that he supports their second amendment rights. In reality, Paul Thelen’s caucus has long supported radical gun control here in Iowa and now Thelen himself is refusing to sign our simple 9-question survey, in an attempt to mask his views from gun owners. >>> In HD 63; over in Waterloo, pro-gun candidate and current Representative Sandy Salmon has signed the IGO candidate survey 100% pro-gun. However, Theresa Meyer has REFUSED to tell gun owners where she stands – but is doing her level best to convince gun owners that she supports your right to keep and bear arms. Iowa Gun Owners simply needs to be involved in these critical races, and we need to get involved today! No other organization in Iowa is fighting to expose radical gun control at the state level. But as I mentioned above, we’ve already spent tens of thousands of your dollars in our efforts all across the state to date, leaving us simply unable to expose gun grabbers any further in these absolutely critical races. That’s why I’m hoping you can help us out to keep these hard hitting ads like the one below, which just kicked off in Sioux City, running across the state. Nothing scares radical anti-gun legislators more than hard-hitting ads like this one. But for IGO to be able to run ads like the one above, we simply must have an infusion of cash! So please, consider donating as much as you possibly can, immediately, to help us with this program. As gun control activists in other states have faced little push back for their radical agenda, they have only been emboldened to attack our freedoms more. Across the country in states like Connecticut and Colorado, as well as others, gun owners’ have seen their freedoms disappear seemingly overnight. We cannot allow that to happen here in Iowa – the freedom of our children and grandchildren is at stake. So whether you can contribute $2500, $1000, or $500 today, or $100, $50 or even just $10, please contribute immediately. I simply don’t know how else to phrase this – we need your most aggressive level of support, and we need it now! So please, click below to hear the most recent hard – hitting ad we have running right now in Sioux City, and do everything you can to help keep these ads going in other parts of Iowa today. And if you are financially unable to help our efforts at this time, but you would like to help out with some of our house-to-house ground efforts state – wide, please let us know right away. Whatever you can contribute – please do it NOW! P.S. Radical gun grabbing legislators like Senator Daryl Beall, Jim France, Senator Amanda Ragan and others are already feeling the heat as gun owners in their districts are being told the truth about where they stand on the second amendment, via direct mail, radio ads, social media and more. If you support or do the bidding of radical gun control activists like Michael Bloomberg there will be a political price to be paid and we will expose you in your districts. Click below to hear the hard-hitting ad we have running right now in Sioux City, where senate candidate Jim France is refusing to tell gun owners where he stands. As much work as we have done already this election cycle; the mail, radio ads, email, on the ground activities and targeted Facebook posts.. there is simply much more to do in races like HD 82, HD 18, and HD 63. However, we have already drained more than our budgeted amount for the 2014 election cycle. So I’m asking for your most generous contribution that you could possibly make today. Whether that be$2500, $1000 or $500, or if $100, $50 or even $10 is what you can do right now – please do so today! The second amendment freedoms of our children and grandchildren are hanging in the balance – please act fast! Come Meet Dudley Brown in Des Moines!